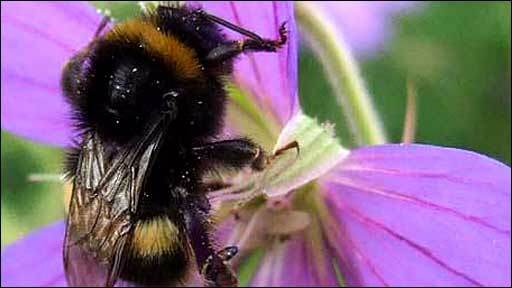 The way bumblebees search for food could help detectives hunt down serial killers, scientists believe. Just as bees forage some distance away from their hives, so murderers avoid killing near their homes, says the University of London team. This "geographic profiling" works so well in bees, the scientists say future experiments on the animals could now be fed back to improve crime-solving. The team's work is reported in the Royal Society journal Interface. "We're really hopeful that we can improve the model for criminology," Dr Nigel Raine, from Queen Mary, University of London (QMUL), told BBC News. 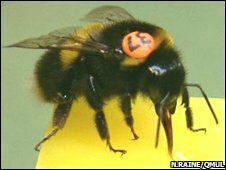 The scientist is working with colleagues Steve Le Comber and Kim Rossmo, a former detective in the US, to tag bees with tiny coloured numbers and follow them from their nests to flower patches. The researchers' analysis describes how bees create a "buffer zone" around their hive where they will not forage, to reduce the risk of predators and parasites locating the nest. It turns out that this pattern of behaviour is similar to the geographic profile of criminals stalking their victims. "Most murders happen close to the killer's home, but not in the area directly surrounding a criminal's house, where crimes are less likely to be committed because of the fear of getting caught by someone they know," Dr Raine explained. Understanding the geographic profiles of animals is interesting to biologists as it helps them predict the locations of important feeding grounds, and knowing these areas will inform more effective conservation measures. This approach works well for very different creatures, from bees and bats to great white sharks. But what is more unusual is that models used to describe bee foraging can be applied back to human behaviour, the researchers say. Instead of using information about the distribution of flowers visited by bees to explain the insects' behaviour, criminologists' models will use details about crime scenes, robbery locations, abandoned cars, even dead bodies, to hone the search for a suspect. "Bees have much simpler brains and so understanding how bees are recruited to flowers is much easier than understanding the complex thoughts of a serial murderer," Dr Raine said. More broadly, the London-based team hopes its work will lead to a better understanding of how one of the most familiar animals in nature goes about its daily business. 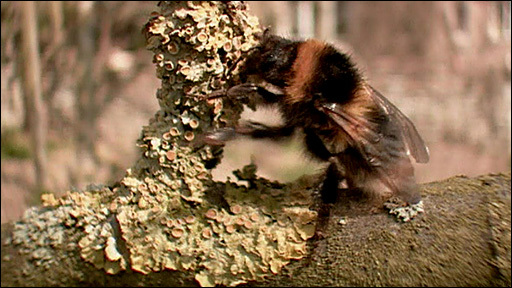 "Bees are hugely important to ecosystems and also important to humans," Dr Raine told BBC News. "Bees' pollination 'services' account for about one in three mouthfuls of food that we eat as humans. They pollinate a huge diversity of our fruit and vegetable crops. "If we don't know how bees forage then we don't really understand pollination, and that is quite detrimental to how we feed ourselves; which is becoming an increasing problem with bigger populations." Dr Raine's team is also using tiny Radio Frequency Identification (RFID) tags - the same technology used to track stock in warehouses or supermarkets - to monitor the movements of bees. The miniature tags are glued to the backs of the insects to record their movements in and out of the hive. The team has also been attaching radio tags to find out more about bee behaviour.